4-Word Review: Old lady goes home. 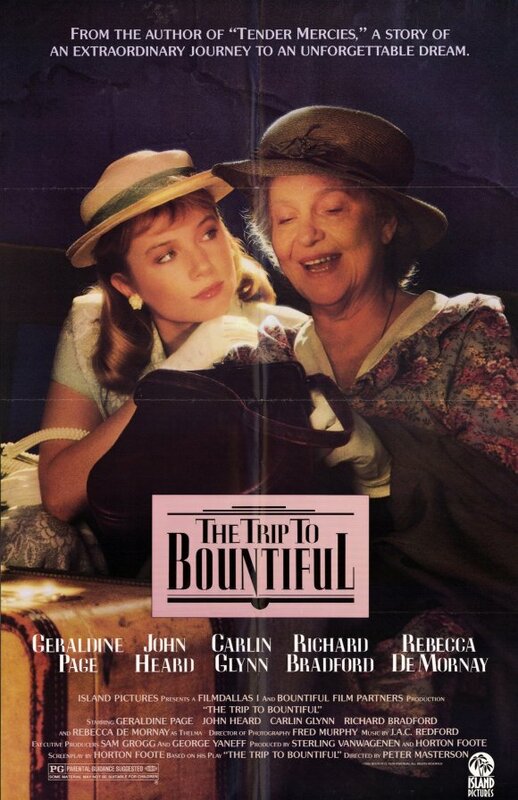 Carrie Watts (Geraldine Page) is an elderly woman living inside a cramped apartment with her grown son Ludie (John Heard) and his wife Jessie Mae (Carline Glynn) in Houston, Texas during the 1940’s. Carrie dreams of one day returning to her childhood home in the small town of Bountiful and ‘escaping’ from Jessie Mae who is overbearing and treats her like a child, but she lacks the transportation or funds. She secretly hides her government checks with the hopes of saving enough to take a train. When she finally makes it to the train station she finds there is no longer any stops to her old town, which is now essentially abandoned, but with the help of the local sheriff (Richard Bradford) he takes her there while Ludie and Jessie follow close behind determined to drag her back with them. 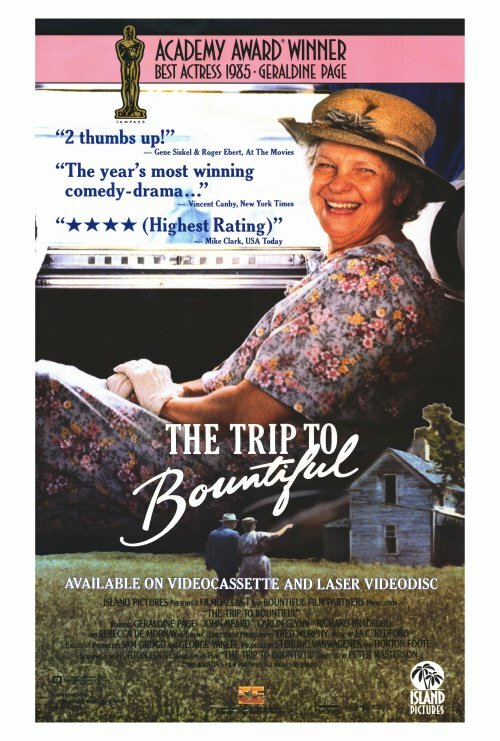 Peter Masterson’s directorial debut shows a great appreciation for Horton Foote’s script as it manages to stay true to the period and tone. I especially liked the part where Carrie describes the quietness of her childhood home while the camera slowly pans the yard and allows the viewer to essentially experience what she is talking about. The recreation of the ‘40s is on-target making you feel like you are living there yourself. Having some tunes of the era playing on a phonograph in the background is a great touch and it’s nice to hear a soundtrack that isn’t from the preverbal classic rock period. Page shines in her Academy Award winning performance. She has played evil characters with such a relish for most of her career that it is nice seeing her portray a sweet old lady for once and do it so well. Her presence adds to every scene she is in and helps make them more interesting particularly with her conversation on the train with Thelma (Rebecca De Mornay) and the way she holds up everyone in line at the train station specifically two men standing behind her who in real life where her twin sons. She also manages to cry effectively with tears actually coming out of her eyes as opposed to De Mornay whose tearless attempts at it where so pathetic it seemed almost embarrassing. Carlin is quite good in the snippy adversarial role and I was surprised she didn’t at least get a nomination for her efforts. Heard is solid as a sort of mediator and De Mornay is perfect for the part simply because her fresh youthful face makes a great contrast to Page’s worn one. The on-location shooting adds a lot of flavor and helps to make this superior over its original stage version. The story itself is slow moving, but a wonderful character study on aging that at times manages to be dryly humorous, honest and sad, but never maudlin. 4-Word Review: Life in pre-war Germany. 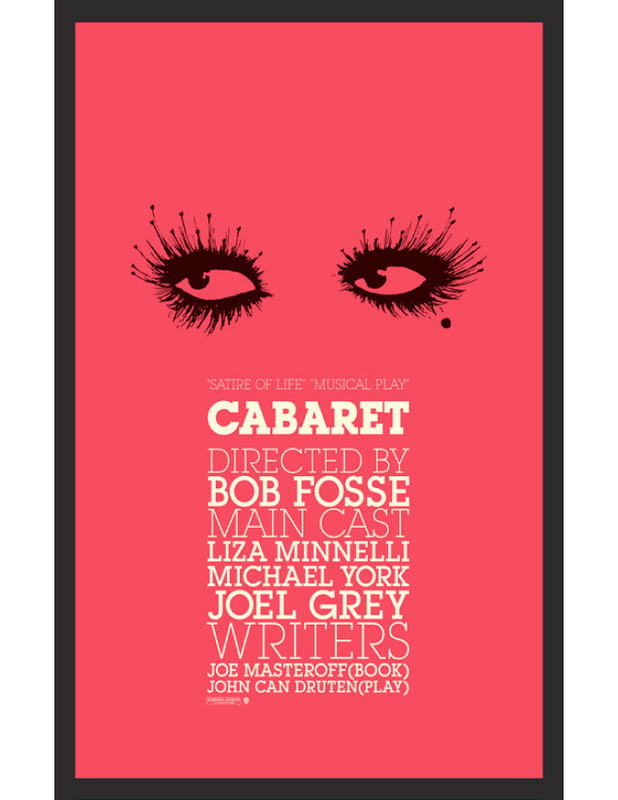 Sally Bowles (Liza Minnelli) is a singer at a seedy Berlin nightclub called the Kit Kat Klub in pre-war Germany. She meets and falls in love with Brian (Michael York) who is a bi-sexual. The two begin a relationship only to have Max (Helmut Griem) enter who seduces them both and gets Sally pregnant. This is a very stylish look at the pre-war years of Germany when it was still under the rule of the Weimer Republic and not yet succumbed to Nazi authority. The dramatic storylines are spliced in-between musical numbers done at the club, which are visually fun and have just the right amount of sensuality and theatrics. 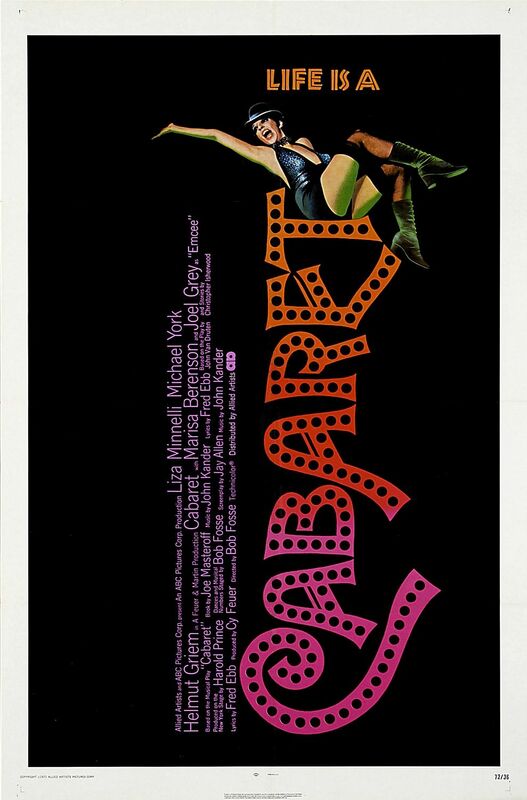 In many ways this looks like an obvious inspiration to the later hit Chicago and netted Bob Fosse the Academy Award for best director. Joel Grey is amazing as the club’s emcee. He has no speaking lines and yet gives a one-of-a-kind performance that also got him the Academy Award for best supporting actor. His distinguished presence gives the film its unique flavor and personality and has to be seen to be fully appreciated. Unfortunately the stories between the songs seem awfully trite. There is nothing really profound or interesting about them and they tend to bog the whole thing down while making Germans look uniformly dopey. 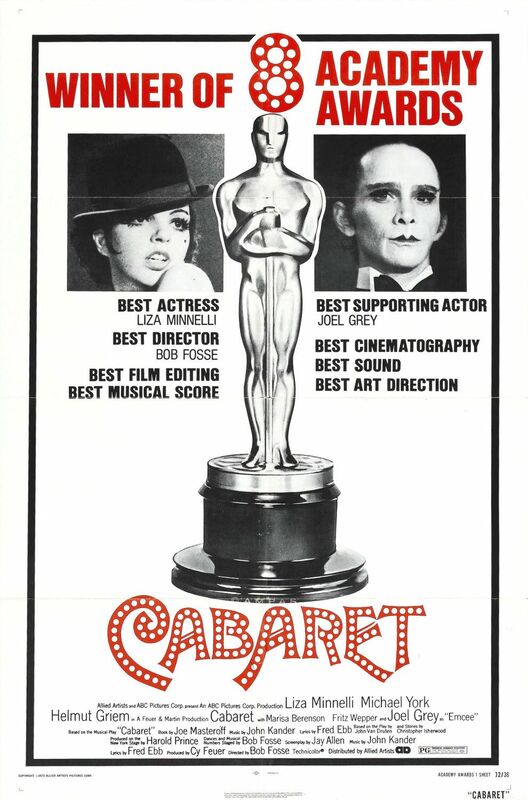 Minnelli won the Academy Award for best actress, but it is hard to see why. Yes she certainly does command the stage when she is singing and dancing, but seems misplaced otherwise. For the most part she seemed to be continuing the insecure, kooky character that she already created in The Sterile Cuckoo without adding any new spin to it. One really can’t sympathize with her nor really wants to and I felt the character became overdone and pushed the viewer’s patience. Pairing her with refined English teacher York helps…a little yet their romance seemed hard to believe. Having this educated, good looking guy become jealous every time she talks to another man seemed unnatural given the circumstances. Technically it is sound with a good eye for detail, but falters dramatically and isn’t strong enough to be anything more than a slight diversion. The only interesting scene to me was when a young clean-cut teen wearing a Nazi uniform gets up and sings an impassioned pro-German song as it perfectly illustrated visually all the rampant nationalism and brain washing that went on and is both creepy and sad at the same time. 4-Word Review: Fanny’s rise to stardom. 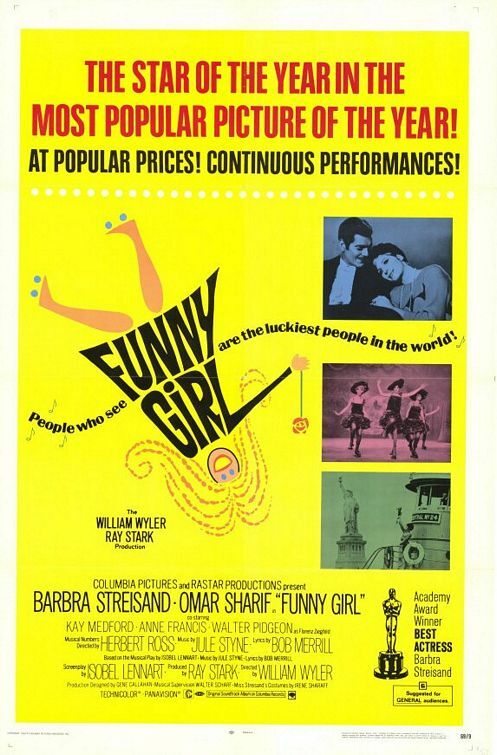 Barbra Streisand, in her film debut, plays Fanny Brice in this loose biography about the Jewish comedian’s rise to stardom in the Ziegfield Follies during the 20’s and 30’s. The story examines how she uses her homely looks to her advantage by honing in her comedic skills to allow her to stand-out. The second half of the film examines her romance and eventual marriage to professional gambler Nick Arnstein (Omar Sharif). Streisand recreates her Broadway role in grand style and deserved her Oscar win in which she famously tied Katherine Hepburn that year for Best Actress. I’ve always liked her best when she is doing comedy and she has always shown a good knack for timing and delivery. Although stories abound how she was very difficult during the production and showed a tremendous ego, which culminated in the film going through two directors and cinematographers she still plays the very insecure Brice effectively and it’s this appealing ingredient the carries the film and character. William Wyler’s direction is also outstanding and helps make up for a story that at times seems pretty light. He replaced Sidney Lumet early on and gives the film an added flair with lavish sets. I loved the French-style restaurant and expansive old fashioned New York train station. There is some excellent dance numbers in which Wyler takes full advantage of the visual element including a nifty ballet segment. The recreation of the period is authentic and there are even a few moments of dazzling camera work including the shot showing Fanny singing on top of a tugboat all alone in the New York harbor while the camera circles above her and then careens down. Kay Medford adds good support as Fanny’s mother and it earned her an Academy Award nomination for supporting actress. Sharif is always solid, but the character seemed poorly fleshed-out and more of a personal background needed to be explored to help explain why he was so infatuated with the extremely insecure and awkward Brice when he could have easily attracted any girl. Walter Pidgeon lacks the commanding presence needed in the part of Florenz Ziegfield and instead comes off as a tired old man getting badly upstaged by Streisand in every scene he has with her. The songs are pleasing and you may find yourself humming some of them for days afterwards, but I was surprised how few of them there really were with long dramatic intervals in-between. The story itself is placid as Brice’s rise to the top happens too quickly and too much time is spent on the romantic angle making the film seem unbalanced but it manages to be entertaining anyways due mainly to the high production values.